Hi. 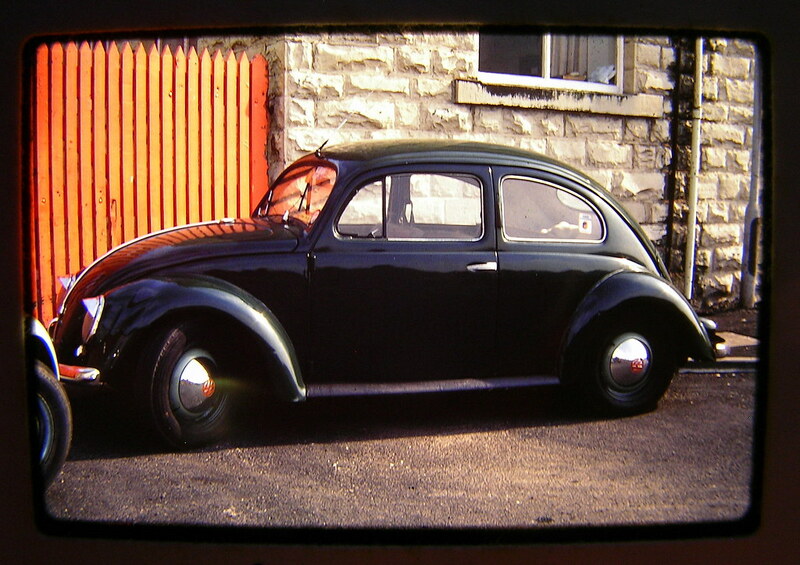 My dad owned this '55 Deluxe Beetle between 1977 and '81 approximately. He got it from the original owner who'd repatriated it in '77 from 20 years in Greece, and managed to get the original UK reg number back. I did see it again at a custom car show in the late '80s, lowered and sporting a black & silver two-tone paintjob, but otherwise reasonably unchanged. I had a look on the DVLA site, and it's been unlicensed since 1990-odd. Anybody got it sitting in their garage? It was unwelded and my dad lathered it in hot waxoyl, so it had a not bad start for survival if stored well. Very nice car ,be a shame if it's not around .Looks like jungle green .Interesting rear number plate to.It could still be around under a different registration as many interesting numbers got sold off .Not sure how you would go about finding it but maybe if you had the chassis number It would help . That numberplate rings a very loud bell in my memory. I´d have to check, but I think that belonged to a pal of mine as his was black and silver. I travelled to many shows in that car back then. He bought it from a (Greek or Turkish) guy called Des Amir(sp?) from Cirencester. I remember picking it up from Birmingham where it had broken down and driving it home to the south coast with a fuel tank propped up on spare tyres on the back seat, as the fuel pump was goosed! My pal eventually sold it and IIRC we spoke to the guy who had it once or twice (or a friedn of his) and he said it was in bits and having all kinds of repair panels fitted. Wether it ever got finished or not, I couldn´t say. That would have been early 1990s. It could still be around under a different registration as many interesting numbers got sold off. If the number plate was reclaimed for the car, it would almost certainly be non-transferable, so cannot be sold off - which is good. Thanks for the replies. The number was reinstated before the age related and non-transferrable sytems started (They were both post '83 and it came back from Greece 1977 ish) so it won't be marked as non transferrable. ..but .. it's still registered to the car on the DVLA computer so it's definitely not been transferred. It was metallic blue originally. 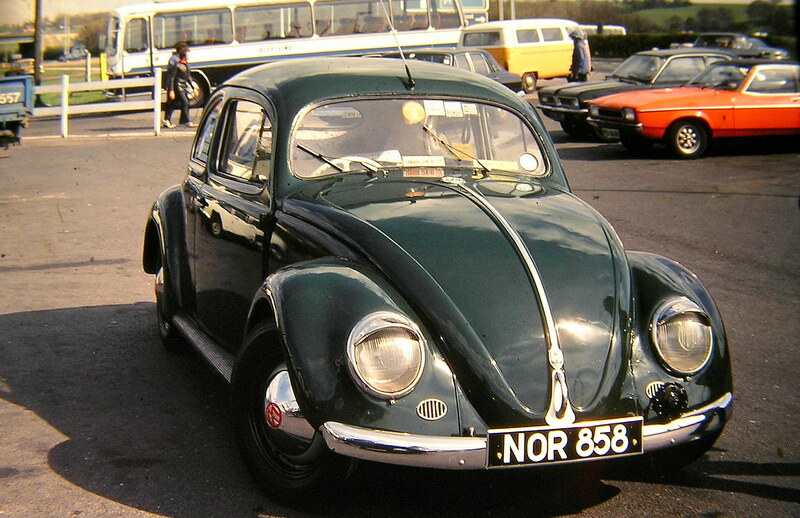 My dad had it resprayed in VW Irish Green (I think it was called that) He also dechromed the sides, made that funny shaped rear plate, and fitted the horn to the bumper cause he fancied himself in a KdF Wagen. It came with '60s rear lamps fitted. The 'heart lamp shells were supplied but no innards, so my dad fitted the '56-'61 type to the original low mounts. Other memories were that it had a later steering column and dished wheel fitted. I remember him getting an oval wheel and discovering the splines were coarser so it lived with the later one back on. It had beige emulsion painted headlining too! Found one more pic of it too. I owned the bug from about 1985, i ran her for about 2 years. When i bought her she had a 1500 engine and was converted to 12v. 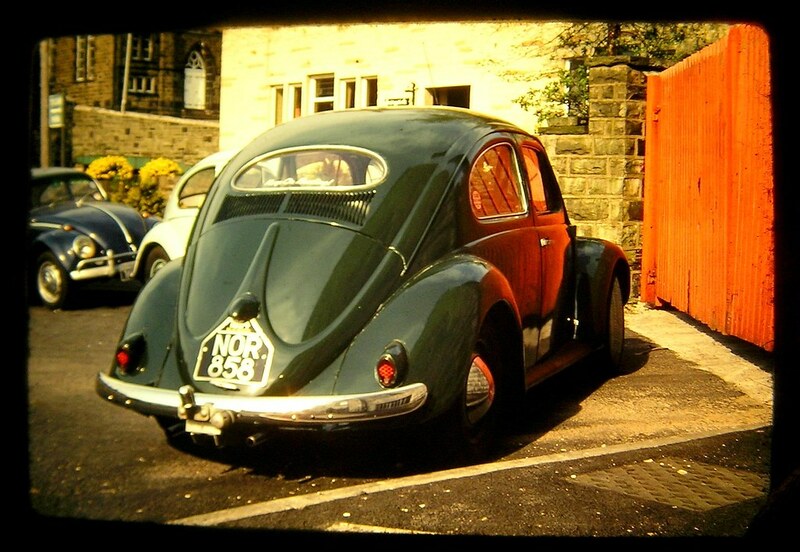 Loved her to bits but had to sell as i bought a '54 with full sunroof, ive still got her and another oval part done. The paintwork was two tone black silver, i eventually sold her to somebody in Nottingham. i wish id kept her, loved the car and plate.